Plot Summary: Sixteen years have passed since a mysterious alien ship crashed on Earth. Graviton City, once leveled by the ship's crash, is now a bustling metropolis. 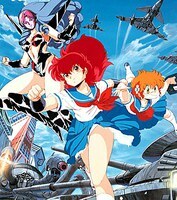 Within the city's high school, superhuman high school student A-Ko Magami dukes it out with the diabolical genius B-Ko Daitokuji, who will stop at nothing to win the friendship of A-Ko's buddy C-Ko Kotobuki. Meanwhile, in outer space, another alien ship is on course towards Earth to find its planet's lost princess. Central Park Media's very first anime release. Music Production: POLYSTAR Co., Ltd.